I spend a significant portion of my time debating and exchanging views with fellow primates on Twitter. I make a rule of never being abusive, hostile or assuming to know what someone else believes. I frequently pose my responses as questions, in order to avoid being presumptuous. I also never tell anyone they haven’t the right to believe what they want to believe, as this would clearly be wrong. I think the most I am guilty of is sarcasm, mockery and ridicule. I’m perfectly comfortable with this. I make sure I deal with the actual statements put forward, whether they are made to me specifically or to the “Twitterverse” in general. I aim to do this as calmly as possible and in a civil manner, often pointing out logical fallacies, or citing sources to address failures to understand established scientific concepts or terminology. I’ve sent more than 11,000 tweets, and when I receive responses they often take the form of glaring ignorance, foul language/abuse/hostility/threats. I have never responded in kind. I simply don’t need to. Once someone decides to engage in that way, they lose any and all credibility, and I chalk it off as a victory. #AnotherSatisfiedCustomer. It is confusing to me that religion appears to be the only domain of discourse where the mildest form of criticism at its expense is labelled as “intolerant” or “aggressive”. This is especially concerning given the influence religion exudes on society as a whole. There seems to be a growing trend, born out of desperation, to label any criticism of religion, however mild as “aggressive atheism”, or “militant atheism”, often atheism is interchanged with secularism to the same extent, but the same fallacy remains. Religion has done an impressive job in modern society of claiming itself exempt from challenge and criticism. There seems to be a consensus within religious circles (and irreligious) that disagreement is all that is needed to constitute intolerance. The mantra “You should always respect people’s beliefs” is directed my way frequently when questioning people’s religious statements. I disagree with this rule on almost every level possible. It is a useful rule of thumb for children within the classroom to instil a rudimentary understanding of the concept of respect; however it is severely inadequate when applied to adult life and the complex adult world we live in. It soon becomes obvious, glancing at the diverse beliefs held on our planet such as misogyny, racism, conspiracy theory, creationism, Voodoo, Faith healers, Justin Bieber’s talent, to name a tiny fraction, that they are not all worthy of our respect and consideration. You may believe whatever you choose, that is your right. You may not however, demand others respect those beliefs by default. Claiming you have a right to your opinions and beliefs is one thing. Claiming a right to have them listened to, respected and accepted without criticism is fascism. Your right to respond is vital. It is (unjustly) almost universally accepted that criticism of religious beliefs is off-limits, and often even considered “impolite” or “taboo”. This is a dangerous concession of your rights. If you are not free to criticise religion, you do not have any measure of free speech at all. This is because the claims of the Godly pertain to the ultimate and most important questions imaginable, from cosmology, to morality, death, life, science, philosophy and nature. If you are not free to have an opinion on these matters, or openly disagree with those that do, you do not really possess any rights to free speech at all. This would be to allow religion the monopoly on these ideas, and would place a theocratic roof over our heads, preventing us from further advancement in our understanding and discussing the ultimate questions. 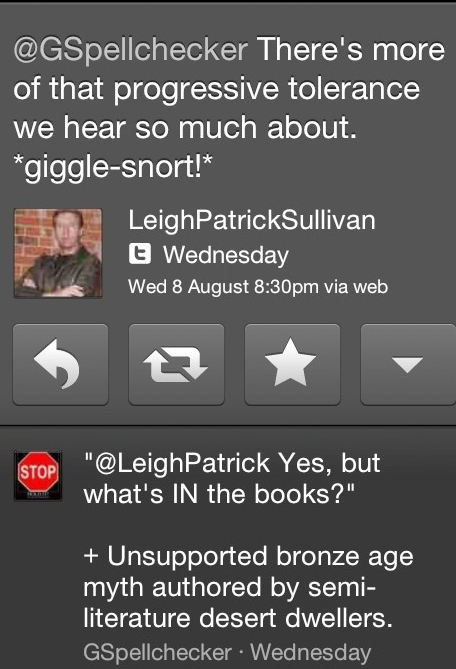 This brings me to a recent Twitter exchange with Leigh Patrick Sullivan @LeighPatrick. Since the individual is comfortable with promoting their Twitter and blog in their own name, I can’t see how it would be unreasonable to display it here. After an evening of interaction on twitter, the user “authored” a blog post the next morning entitled “Atheist ‘Tolerance’ Revealed’. I don’t buy this at all. It seems like a thinly veiled attempt to justify being thoroughly out debated, post-debate. Or saving face as it is commonly known. “ha! It was part of my plan all along!”. This dishonesty allows them to frame the criticism they received as expected, and unreasonable, without accounting for what was said, and what accusations were made. If I were to purposely invoke reaction as part of a “social experiment”, and in the course of doing so, intentionally assume the role of an obnoxious ignoramus, I would be sure to document my intentions beforehand, to counter any claims of dishonesty. It’s telling to see this wasn’t done. Odd considering it was part of a “plan”. Even if I accept this is the case for the sake of argument, which I am happy to do, I still disagree with its premise, and accusations/conclusions made during the course of discussion. I can’t account for every atheist they exchanged tweets with, and whether or not they remained reasonable (I’m sure many didn’t), but since the charge of intolerance and intent to stifle the right to believe were levelled at me personally, even in light of my consistent civil demeanour, I feel the need to share and refute the claims for the flights of fancy/lies that they are. 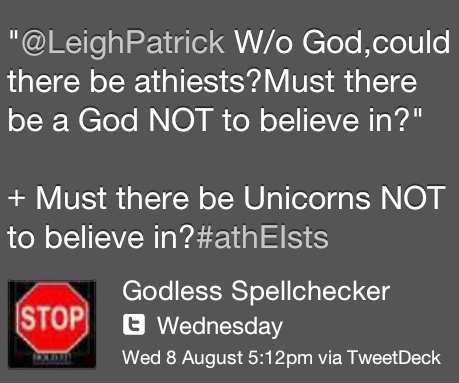 This catastrophic failure of logic, was to suggest there must be a God, in order for atheists not to believe in him. I provided a suitable comparison in order to highlight the failings of the comment, and was kind enough to supply the correct spelling of “atheists”. You will notice at this point, I am in no way assuming the beliefs of the tweeter, nor telling them they have to believe anything. We are firmly in the realms of discussing logic. It soon becomes clear hereafter, that the conversation we are actually having, and the conversation they assume we are having are very different. Many attempts are made to detract from the points at hand, in order to accuse me of intolerance, or “attacking”. I’ll leave you to judge whether I appear intolerant, or whether I attack/assume any personal beliefs, or claim they have no right to hold them. My comments, need little explanation. I doubt there is anything controversial here. It is a well documented historical fact that religion was enforced in the most heinous ways possible. There was a time when there was simply no other choice but to be a person of God. So, at this point I have only made some logical and historical statements in a direct, yet civil manner. I haven’t made any comments/assumptions about people of faith, or attacked anyone personally. 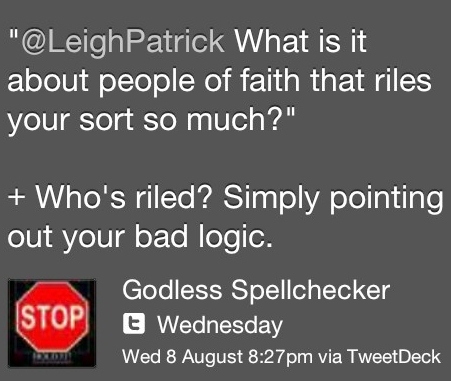 I’m then accused of being “riled” by people of faith, and referred to as “your sort”. I’m not sure what assumptions are being made here, or what my “sort” constitutes, but it doesn’t at all seem positive and taps the boundary of prejudiced generalisations. I don’t rise to the bait, I explain I am not riled in the slightest and simply reiterate my intentions were to highlight bad logic. When I dare to suggest the Bible is bronze age myth, authored by semi-literate desert dwellers, I am instantly accused of intolerance. As if to say, because belief is concerned, I have to ignore the historical facts regarding the origin of scripture, and accept its claims. What else shall we pretend isn’t true in order to avoid contradicting beliefs? Is this a mature mentality to adopt to questions of this nature? 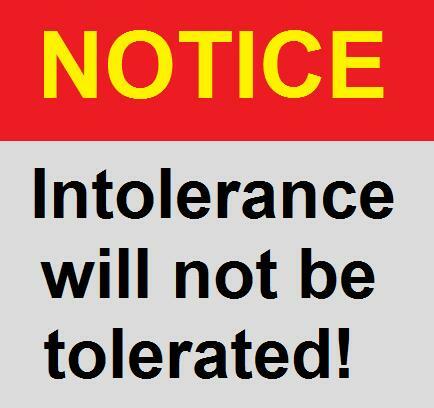 It appears any reasonable, factual statements to the contrary of religious beliefs, are instantly intolerant. Am I to pretend something isn’t what it is because beliefs are involved? Now, notice when an attempt is made to discredit something I hold to be true, i.e “The Big Bang”, I don’t claim intolerance, or result to asking “why your sort” has such an undeveloped scientific education. Of course, as we know, The Big Bang is not a faith-based position, but a scientific fact supported by an abundance of observable evidence. As we can now see, it is now my responsibility to educate an adult on the nature of the cosmos. I provide the above image, detailing what we know about The Big Bang, and how we know it. As is common among people with low scientific understanding, facts are often dismissed as “just a theory”. “Scientific theory” does not mean “guess” as sometimes used in the common vernacular. I provide this link, which details the correct meaning of the word “theory” in the scientific context, and how theory is the highest status any scientific observation can attain, eg. Gravity, germ theory etc. 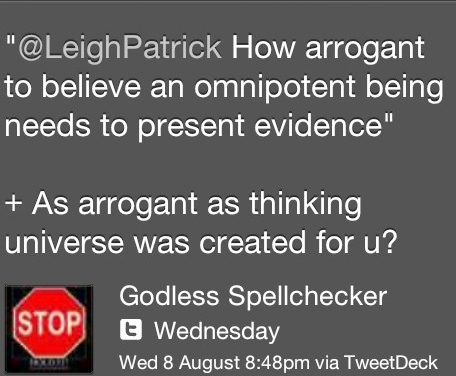 So, now we have not only an assertion that there is an omnipotent being, but accusations of arrogance for simply asking for evidence. Asking for a claim to be supported is textbook “reason”. 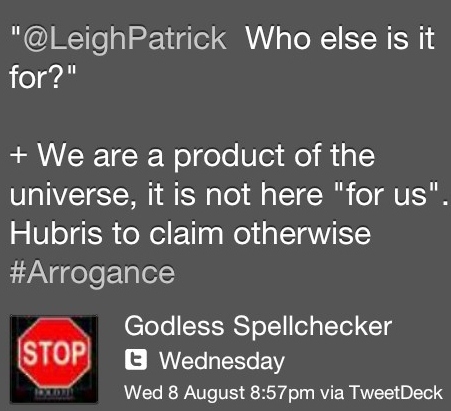 I point out it takes significantly more arrogance to assume the entire Universe was “created” with you in mind. Another assertion is made in the form of a question. If the universe isn’t here “for” us, who else is it for? We know the sum of our parts, and the earth is a product of our Universe. There is no indication, observable or otherwise to suggest any of this had us in mind. Large portions of our planet cannot support life, and eventually the sun will boil our oceans and obliterate us. Some design. So, now it appears asking questions in regards to claims made, and putting forward established scientific fact in a calm manner is pushing my opinions. Turning the attention to me personally is a blatant defensive reaction in the face of contradictory, hard cold fact. When ignorant claims are made (The big bang requires faith!) instead of acknowledging this failure of understanding, efforts are made to employ “loaded question fallacies” concerning “intolerance” or “the right to believe”. I’m not pushing my opinion. As I will continue to reiterate, I am disagreeing with statements made. Do I not have the right to do this? I make the point It is not “my” opinion I’m stating, but scientific fact that can be found in the books of any high school in the developed world. Again, defensive avoidance is used to turn the attention to me, instead of the facts at hand. I keep on topic, and do not rise to the bait. And we appear to be going in circles. In an undeniable display of wilfull ignorance, no attention was paid to my attempts to educate on the meaning of the word “theory”. Again, something I hold to be true is belittled. I make no claim of intolerance, or attempt to ask why he is pushing his opinion regarding The Big Bang Theory. I provide the link to the correct definitions once more. More defensive efforts to avoid the issues at hand. I’ve never mentioned a belief system, assumed to know what his particular one is, or told him it is based on lies. I’ve made generic factual statements about scripture and the nature of the cosmos. Again, am I obliged to pretend these things are not true, because someone “believes” otherwise? I calmly make a reasonable point, and make the charge of dishonesty in their accusations. 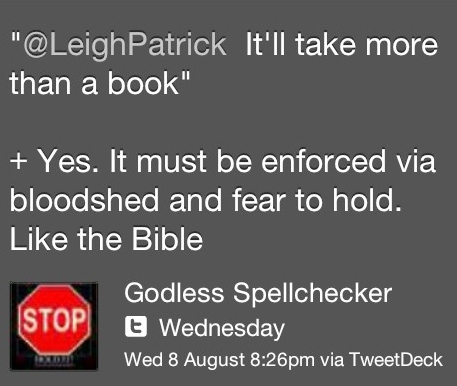 A fellow atheist and twitter comrade makes a valid, if not amusingly flippant point about scripture. This is instantly dismissed solely due to him being Scottish. Racial intolerance and stereotyping? I believe so. More defensive accusations. I’ve never claimed to be bugged by anyone who believes in god, I have thus far dealt with the poor logic, scientific claims and statements made. I reiterate that he is conversing on a public forum, and therefore inviting comment. 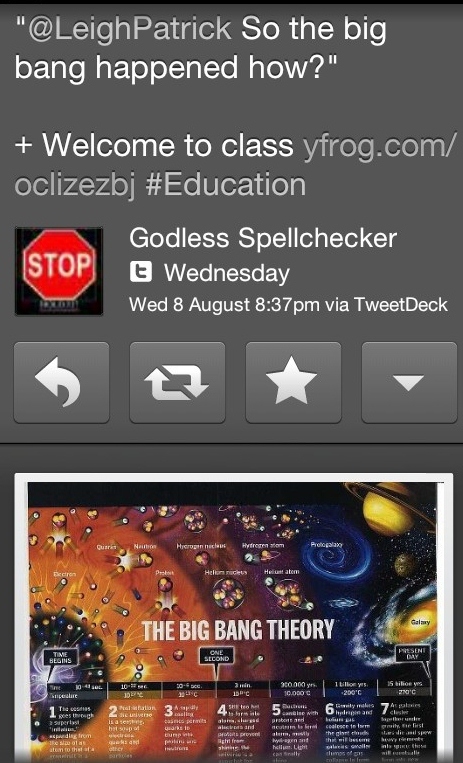 Another Twitter comrade, reasonably requests evidence for the existence of any God, based on a previous claim made. The question is deflected, by what I consider, an inappropriate personal question. I think we can already see where this is heading.. Despite the personal and inappropriate question, it is answered politely. It is confirmed that they indeed did love a grand parent. They are then swiftly told to “Prove It”. 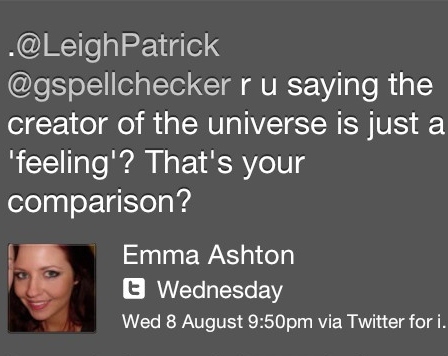 The arrogant assumption being, because a creator is unseen, and so, seemingly is emotion, it is a valid comparison. Nonsense. Thankfully, especially given the delicate nature of the question, it is seen for what it is. I point out the observable nature of emotional feelings, and my distaste of the appeal to emotion tactics. 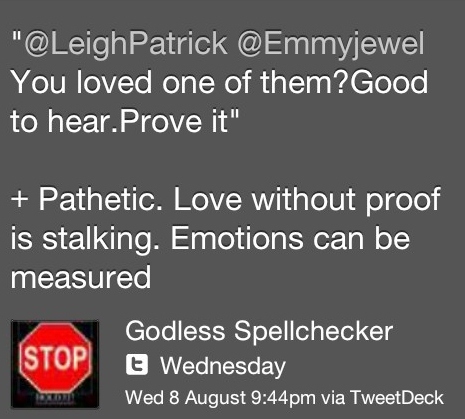 Another Twitter comrade smartly elaborates on the observable nature of emotions, demonstrating how it is not comparable to that of a creator. Another, unintentionally humourous failure of logic is postulated. Basic logic will tell you, evidence of emotion is, evidence of emotion. Not evidence of an omnipotent superman. I make the below observation regarding Santa. Point made. This question is asked when It is explained emotions can be understood and explained from a chemical level. 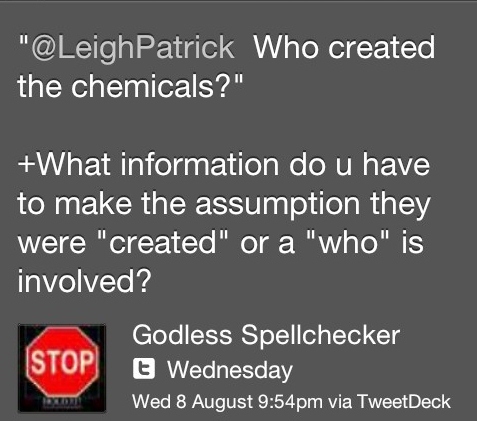 The assumption of a “who” is made. Another fallacy, common amongst the majority of theist I converse with. It is not logical to assume in the absence of a real explanation, that a supernatural one is reasonable, or by any way the default position, for obvious reasons. “we don’t know x, therefore God” is an assumption, and an unsupported one at that. An argument from ignorance is made. The assumption being, that If I am not able to explain the origin of something, then God is the winning explanation by default. It is worth noting, that any question, ever answered, in the history of the Universe, ever has turned out… not to be God. I doubt this could be much clearer in stating I have no issues with people believing what they choose. But If i don’t think it is true, I likewise have the right to say so. This appeared to conclude our exchange. For The Evening. On to the following evenings fun..
As we arrive at the following evening (don’t worry, we’re nearly there! 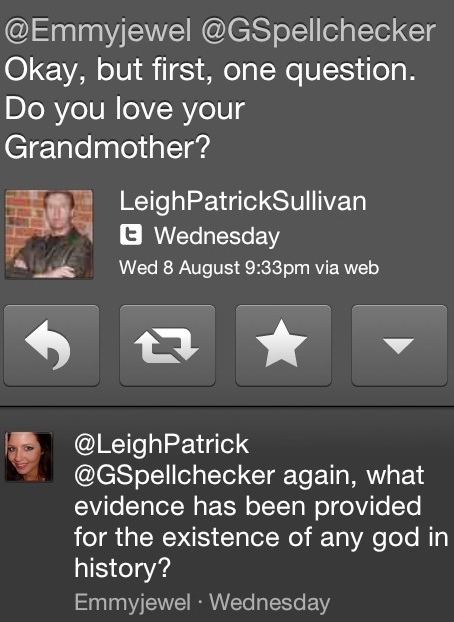 ), a response is made to a claim that God has failed every scientific test imaginable for the claims of theist. This is scoffed at, obviously. This is odd. The Godly like to position their chosen deity outside the realms of science. They attempt this without realising the existence of a creator is a scientific claim. The claim is not subjective. There either is a creator, or there isn’t, and there is either evidence for one, or there isn’t. Also, as soon as you begin to add the further claims of scripture, this falls firmly into the realm of the testable. The age of the earth, the origin of species, the power of prayer, miracles etc can all be discredited by the scientific method. The best measure we have of knowing anything. 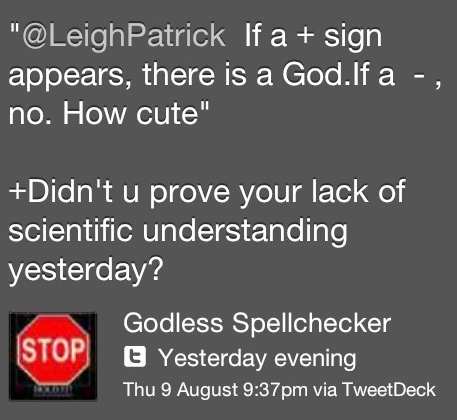 I flippantly point out the failure to grasp basic science the previous evening. I again, point out the undeserved claims of intolerance, and assert my doubt regarding his claims of a “social experiment”. Another claim that I am attacking beliefs. I reiterate I dealt only with the statements made. Even at this point, I am still in the dark as to their personal beliefs. I again make it clear, it is the claims/statements I have dealt with, and nothing more. More accusations. 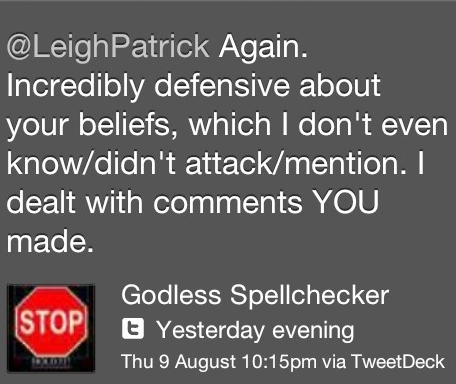 I reiterate I haven’t even addressed beliefs, nor have I demonstrated an inch of bother. I doubt I could make the above any clearer. Another loaded question fallacy regarding free speech, rather than any of the subjects we have conversed about. More deflection tactics. Now, this is truly incredible, and not because a grown man exclaimed “pwned!”. There appears to be a complete failure to grasp the difference between having a right to your opinion, and claiming the right it should be immune to criticism. This is all but stating I have no business disagreeing with what they say. Now THAT would be suppression of free speech. I explain myself. Reasonably. Again. It appears, I am now in fact being told what I believe. The irony. We end on the above. In short, it appears disagreement is falsely portrayed as intolerance, in order to avoid being held accountable for statements that are demonstrably untrue, or cannot be supported. 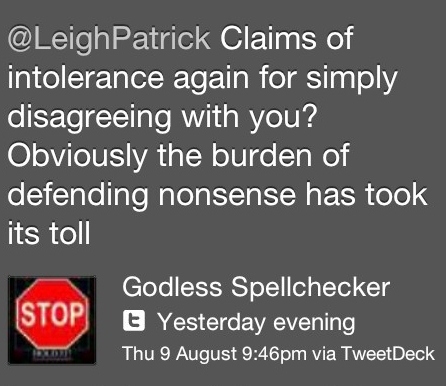 The individual claims in their blog they were reasonable, and were essentially set upon by intolerant atheists. I believe I have demonstrated how this self-delusion is a result of being unable to intelligently support their statements. Not at any point did I suggest they should change their beliefs and join the dark side. It’s important to note, this entire exchange was a result of publicly made claims/statements. Twitter does not exist solely in your lounge, on your laptop, or in your palm courtesy of your smart phone. Nor, unless the necessary privacy settings are tweaked, are your comments exclusive to your followers. It is a social network and globally connected public forum. Anything you tweet is an open invitation to everyone who has access to the internet, to view and respond to your comments if they wish, for better or for worse. Claiming intolerance when people disagree with your comments on a global public forum, is nonsensical and holds zero weight as an intelligent argument. You should think of a tweet as similar to scrawling your opinion on a T-shirt in clear and large letters, then going about your daily routine with it on. Except, your tweet isn’t a garment you can simply remove, it is digital and its fingerprint remains, to be shared amongst an unfathomable number of people, that you would not even be able to fit in the space that accommodates your daily routine. Turning up to someones place of work, residence, or even phoning them to berate them for their beliefs, without any instigation would be intolerant. 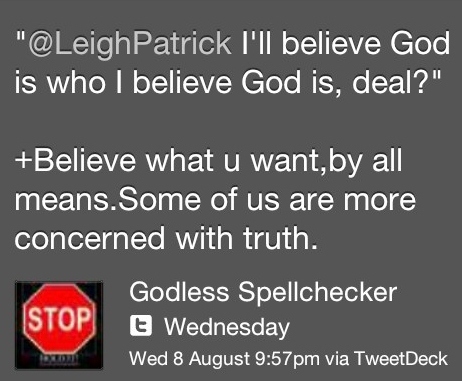 @LeighPatrick tweeted regarding atheists. People responded. There is no surprise here. Twitter actually does NOT work in mysterious ways. I fail to see how a claim can be made that this is a representation of attitudes towards Christians in modern society. Even if there is an inch of truth in the “Social Experiment” claim, and an inference that this wilful ignorance could be attributed to an “act” for purposes of research, this still falls firmly in the territory of Poe’s Law. None of any of this infringes on your rights to believe what you want, or to hold any opinion you may have. Nor is it representative of “Modern society” and its “attitudes towards Christians”, as the ego stroking blog piece claims. Twitter is a public forum, debate will be had, nonsense will be called out, ignorance will fly, such is the internet. There is an alarming number of instances of late where “Christian persecution” is claimed, often simply for being denied certain privileges no other group on the planet demands: assuming your beliefs are exempt from criticism. Shouting “intolerance” whenever direct claims/statements you have made, especially publicly, are challenged is nothing short of disingenuous, and you won’t get away with it. I think you can leave the concept of ‘tolerance’ out of the discussion altogether. It’s a good principle to live by, but it has little to do with the politics of sexuality or gay rights. I think I know what you’re saying, but Would you mind detailing your points a bit more so I may gain a better understanding? Is the first comment from another conversation, or… Anyway, nice post. It’s always good to see logic prevail once again. I’ve had discussions with some of these people lately, and while I don’t always have your restraint, they employed the same tactics. 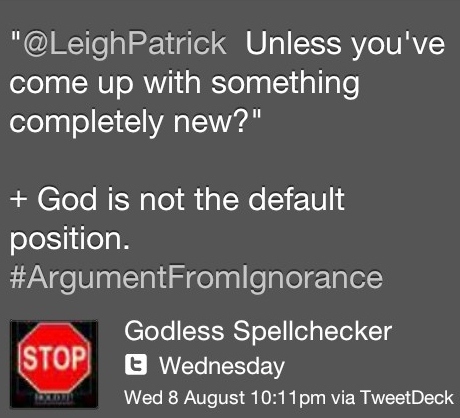 Like stating the bible as fact, and misdirection especially. “Why are you so upset with God?”, they ask, or telling me I’m mad and my “heart is hardened.” Actually, it was this: ‘The sad part is you may miss your opp to know His Love b/c of your harden hearts Jason’. Yes. My harden hearts. Both of them. What’s really sad is that some people are just happier living in a fog, and too dumb to educate their way out of it. They obviously have the internet, the ones that we talk to, anyway. And if it weren’t for one thing, I would leave them alone and let them be delusional. That one thing is they teach their children this garbage. Not just teach, either, but bang it into their heads until they’re adults and by that time it’s too late for many. I believe it’s child abuse. Telling kids that God let his son be tortured and killed, and if you don’t believe in him then you’ll go to a fiery pit for all eternity? How is that not child abuse if there is no ‘It’s ok honey it’s just a story, go to sleep now’ at the end of it? Ok I’ll shut up now. Keep doing what you’re doing. You do it very well. I am continually impressed with the service you provide. I saw a video recently of the biological advantage to being awestruck. This is impressive and I hope others can also find an appreciation of understanding. God does not need to be proven. God cannot be proven. Proof denies faith, and without faith, God is nothing. However, it is fallacious and counter-intuitive to even try to use evolution/big bang as attempts to disprove God. First, because God, by definition, is omnipotent, omniscient, and omnipresent. For God to be everywhere, know everything, at all times, clearly God must be totally beyond anything we are capable of fully understanding, and also, clearly God must exist at some level “beyond” our universe. Even Hawking’s multidimensional string theory doesn’t discount God! To simplify the point: Evolution does not disprove God: God created evolution. The big bang does not disprove God: God caused the Big Bang. The second reason it’s counter-intuitive and fallacious to try to disprove God is this: If God existence cannot be proven, then it cannot be DISproven either. One way or another, you require faith: You have faith that God exists, or you have faith God doesn’t exist. to believe that some guy was born from a virgin, grew up, performed all kinds of miracles, told people to act towards others as they would have others act towards them (my corollary to which is “the manner others act towards me is an indication as to how they would like me to act towards them.”) got nailed to a tree and left to die for doing so, then came back three days later and finally ascended “out” to “heaven”! 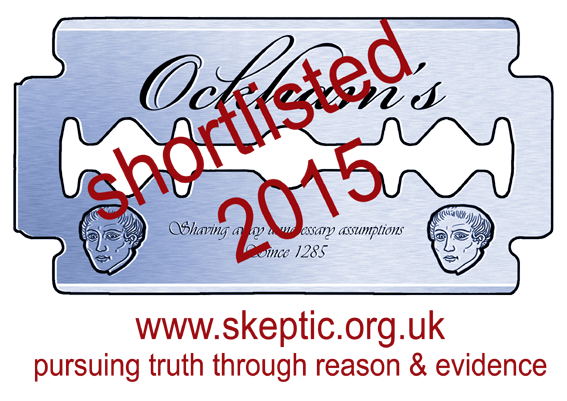 I am the first to admit it denies every aspect of science I know and adhere to. Yet I -choose- to believe this. Not, as some may think, as “fire insurance,” but because I find that following this belief system gives me hope that, in X years time – preferably later, rather than sooner, something other than oblivion is waiting for me. After all, if we all vanish into oblivion, life is really, at the end of it, completely and utterly pointless. 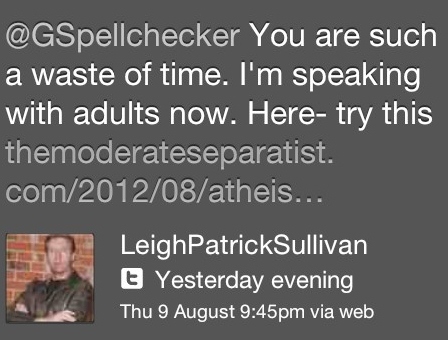 If atheism works for you, by all means, fill your boots. 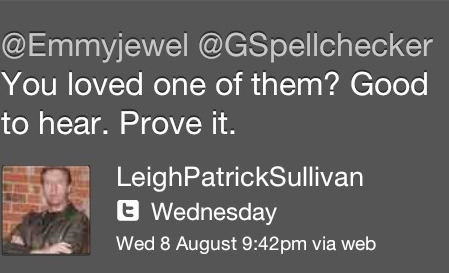 But your approach to LeighPatrick is far from the totally innocent and “questioning” nature you claim it to be. Thank you for your comments. I will address some of your points. The above mentioned person arrogantly infers the Big Bang requires faith. Although “read more” may be flippant, it is rather mild and nothing short of a valid point. If an educated understanding of The Big Bang was present, such claims would not be made. I did not dismiss his “position” as wilful ignorance at all. 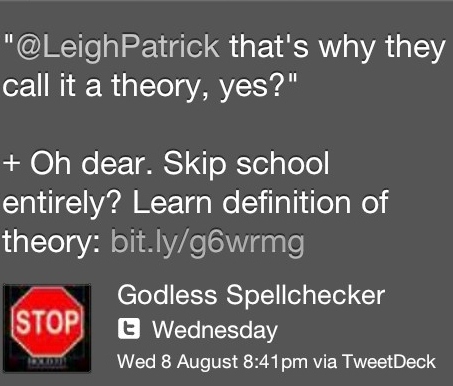 “Wilful ignorance” clearly referred to the ignorance of the correct definition of “theory”. I was kind enough to supply the correct definition. This was ignored, as is evident from his subsequent misuse of the word. This is wilful ignorance by definition. I was being sincere, not condescending. I disagree. Comparing mention of the Big Bang, or various other established sciences, to that of making Nazi analogies, is quite frankly, a bizarre statement. I’m not sure what you intend to demonstrate by making this ridiculous comparison. 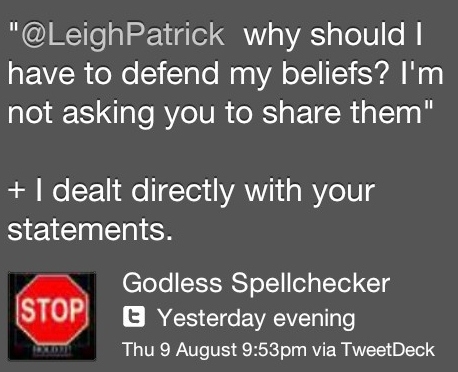 What I think you are essentially saying is for facts to be kept out of debating God. You cannot simply dismiss scientific fact (bizarrely) as Godwin’s law because its contradictions to your faith are a damning inconvenience. If putting forward established scientific fact isn’t a credible way of making a well-reasoned point, what is? Also, I was not discussing faith. I was discussing science and logic. If these things offend people of faith, that is not my issue. The facts remain. It is worth noting as well, The Big Bang is not brought into the conversation by myself, an assertion is made about it without any previous reference. I am also challenged to explain the Big Bang. All this is irrelevant however. Science is not needed to build a case against the God assumption, rational thinking is enough. God does not need to be proven? If you assert we are in fact “created” by a supernatural deity, and furthermore, this deity cares about your life, what you do, with whom, and in what position and there will be consequences or reward for this upon death, then I say evidence IS required. The definition of your God is irrelevant. The attributes you have stated are simply unsupported assumptions. You say god does not need to be proven and is not fully understandable, then go on to assert his attributes. This is having your hypocritical cake and eating it. You must prove your god exists, before telling me what he’s like. The claim of a creator IS a scientific claim. Your faith does not change this. Lastly, Hawking is an atheist. He has openly said a creator is not needed for our Universe, and he does NOT believe there is one. Read more. Of course Evolution does not disprove “God”, nor have I claimed it does. Nor, do I recall mentioning Evolution at any point at all actually, but since you have chosen to bring it up, I shall discuss. Evolution does not disprove God. Nothing can disprove God; it is an unfalisifiable and weak position, as you have just demonstrated with your above comment. Whenever science discovers anything about the complexity of species, or the origins of our cosmos that directly contradicts the biblical “account”, disingenuous individuals such as yourself shift the goal posts. A desperate “ha! So Gods plan is even more complex and mysterious than we thought”. No. Evolution does not disprove God. Mainly because God is anything you decide him to be, as he exists solely in your head. God, to you, is subject to change when contradictory evidence comes your way. This is denial of observation to preserve faith, not honesty. Evolution does put to bed any biblical account however. Maybe consider deism? Not a day goes by when a theist fails to grasp “The Burden Of Proof”. If you assert something exists, the onus is on YOU to prove it, not the sceptic. Because something cannot be disproven, does not lend credibility to the claim. You cannot disprove, for instance, that an invisible alien called “Stephen” lives in my garden. He grants wishes, and will take you aboard his spaceship when you die. Can you disprove any of this? No. Then I guess you will just have to have “faith” he doesn’t exist. Furthermore, if an atheist rejecting your god requires faith, you must require faith to reject the thousands of other Gods postulated throughout time. Is rejecting Allah a faith-based position for you? Thor? Zeus? Odin? How many faiths do you have exactly then? It does seem crazy. To a lot of people, for a lot of good reasons, which (and this is the frustrating part to some) you are obviously intelligent enough to discern for yourself. Choice is completely irrelevant. Your “decisions” do not reflect on truth one bit. There is no grey area with these myths. There is no supporting evidence at all. Furthermore, there are large quantities of evidence that directly contradict these claims. 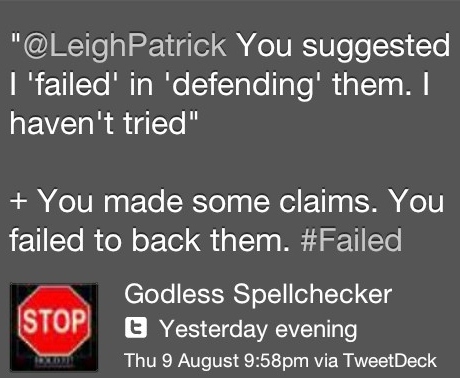 You may call it “faith” in defence, but you are simply conceding you will believe absolutely anything, on little or no evidence. And here we have it. Often, if you scratch away the surface of faith you will find a security blanket. The universe and truth does not owe you “hope”. Or anything for that matter. Truth is not obliged to make you feel better. It is what it is. 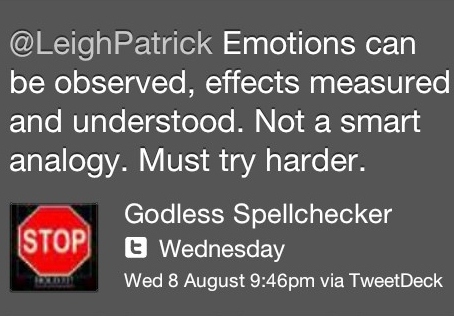 Deciding what you believe solely on how it makes you “feel” is no intelligent measure of “what is”. I see nothing in your comments that backs that claim at all. I agree with GS here; this is wilful, deviant ignorance. As for being condescending? 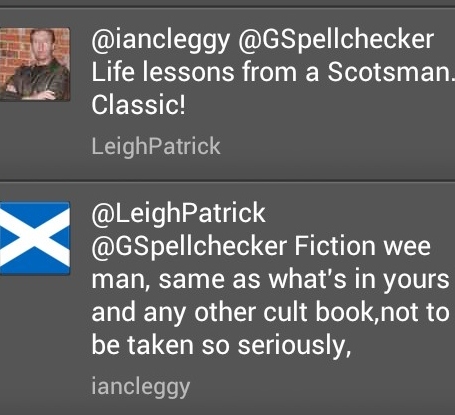 I think Mr. LeighPatrick deserves the treatment he received in the end. He didn’t have any problem rising to it himself. Godwin’s law states that in an internet discussion, over time, the likelihood of a reference to the nazis or fascism approaches 1. You made a reference to fascism in your original post. Now, what I am saying is: in every about religion or faith, over time, the likelihood of a reference to evolution/creation and/or the Big Bang approaches 1. I’m all for keeping fact within the debate; but I do get very sick and tired of atheists; be they you or others, who try to paint all people of faith as rabid, anti-science, evidence-discounting wackjobs. To be clear: YOU have not (yet) made that attempt. Others have. Repeatedly. And it is tiresome. Not a day goes by when an atheist fails to grasp that religion/faith is not a scientific field of study. One cannot approach a faith – which requires a departure from that which can be observed – with the scientific method. Faith is, simply, a choice. So “proof”, so to speak, isn’t needed. It takes far more faith and effort to be an atheist than it does to believe in God, and that’s as far as I’m going to bother to go in responding to your Ricky Gervais quote regarding which gods I accept or reject. I know who Stephen Hawking is, and what he believes. As I’ve stated, his theories only go so far as to explain what is here and how they may have come about. His concept of the universe being an equation which adds up to zero is all fine and good, however it still doesn’t explain how nothing (which, by its nature, must be in a state of perpetual equilibrium, there being no way for it to be otherwise) can, spontaneously NOT be nothing. By the way, I’ve read lots. Statements like “read more” are condescending and have no place in a civil discussion, because they show disrespect towards the other person. You claim to always be respectful; however actions speak louder than words. Choice is completely relevant. I have looked at the “evidence”. I have seen what is, and read and learned about how science tries to explain it. The science of explaining what IS is perfectly valid; but science continues to fail to explain WHY and WHERE FROM what IS came into being; and, by science’s very nature, cannot ever hope to do so, as it is based solely upon observing and measuring that which IS. The realm of God and faith deals with that which is “beyond”. If you want to frame it mathematically, if Y=1/x, as x -> 0, Y -> infinity. God exists at, or even beyond X=0; Or, if you prefer, God is the square root of negative 1 (without extending the math to the compex plane). If you cannot choose to see beyond that which is, and open your mind up to the realm of possibility and that there is more than we can possibly observe, measure, and understand, THAT is a very sorry view indeed. You are actually guilty of the fallacy fallacy here. When directly discussing issues of intolerance, or ideologies being exempt from criticism, fascism is clearly a relevant and worthy note of topic. We are in fact, discussing fascism. Again. This is science, not an adage or fallacy. If claims are made about the nature of our cosmos, that contradict current scientific understanding, it is not comparable to “Godwins law” to reference them. I think this is a really poorly conceived comparison you are making. 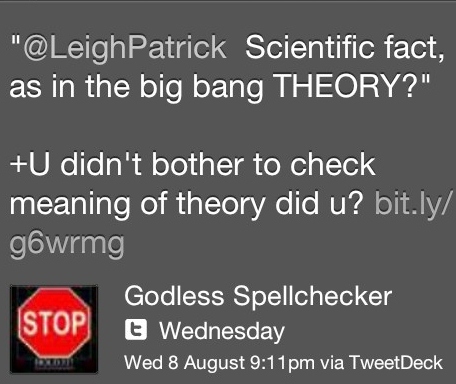 And furthermore, as stated previously, I did not bring any science into the discussion, Big Bang or otherwise. It was asserted to me I already accept the Big Bang as truth, and require faith in doing so. Agreed. However, not relevant to our discussion. This, is simply nonsensical. The assertion of a creator is undoubtedly a scientific claim, regardless of how a person of faith likes to frame it. The existence of a creator is not subjective or a choice. A creator exists, or a creator doesn’t exist whether you choose so or not. There is either evidence for this, or there isn’t. This does not vary depending on what choices you make. Whenever you make a claim that God is outside of “nature” of the “observable”, you are simply claiming the natural order has been suspended. This is in itself, a scientific claim. I don’t understand why you would think defending faith as a “departure from observation” makes for any sort of worthy argument. I refer you back to Stephen, the invisible alien. He is a departure from observation also. I trust this is already sounding tediously nonsensical. It is all the more hypocritical when you invoke scientific reasoning only when you believe it supports your position, but then you’re so ready to undervalue science when it contradicts. I don’t believe I was quoting Ricky Gervais, as this is a very old exercise in logic, but regardless the point is valid nonetheless. So I am to take it you have no answer to the question then? So we both don’t know the origins of the cosmos then? Applying the supernatural to an unknown is nothing more than God Of The Gaps rationale. Absence of an explanation, does not mean god is the default position. This fails to adequately answer the original question, and raises more questions than before. Occam’s razor has taught us this is not an intelligent way to reason. You also fail to realise God IS your “nothing spontaneously NOT being nothing”. When asked to explain the origins of the creator, we usually get some vague “uncaused caused” apologetics, or assertions of “infinite beings”. This all boils down to conceding you think something CAN come from nothing, you just give it a different name. Completely contradicting your jumping off point. Any attribute you can apply to God to wish away explaining the creators origin, can just as easily be applied to the Universe. And as we know, the Universe exists. I’ve never claimed to be respectful. I made my point about obligatory respect clear in my initial blog post. I can categorically state I do not respect people who live by faith, nor do I respect their unsupported and often harmful beliefs. I respect their right to have them, if they so choose. Nothing more. 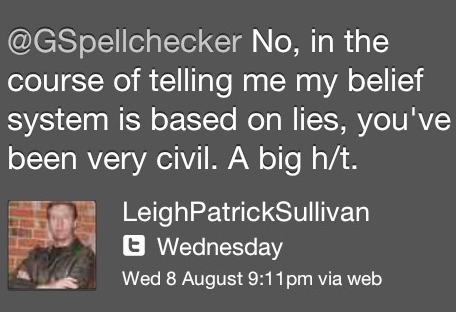 I do not accept I was uncivil. 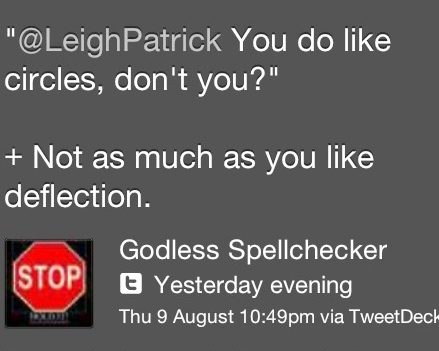 Especially in comparison the obnoxious attitude of @leighPatrick. “but science continues to fail to explain WHY and WHERE FROM what IS came into being; and, by science’s very nature, cannot ever hope to do so, as it is based solely upon observing and measuring that which IS”. The “why” part is another assumption. This goes back to my previous statements that the Universe does not have you specifically in mind, or owe you anything. That position is not uncommon, such is the workings of the human ego. I agree science cannot explain everything, nor should anything be thought of as “impossible”. So how do we get from that to, “there IS a creator, and he LOVES us”. Complete hubris. “The realm of God and faith deals with that which is “beyond”. No. this “realm” simply claims access to knowledge it cannot possibly have. It does not explain anything. It is essentially a will to be ignorant, and evem worse, proud of it. My mind is wide open to the realm of possibility. New information does not have to be squeezed and incorporated into my already rigid belief system of “There is a god”. My views are subject to, and do change based on new information. 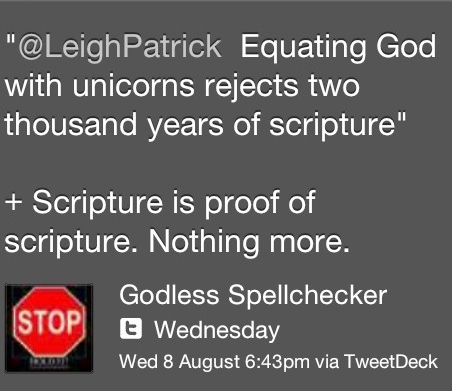 For the theist, new information is either rationalised to fit scripture, or ignored altogether. To be a person of God, and preach about the realms of observation and open-mindendness is incredible. If it turned out tomorrow, God revealed himself, it would just become part of our current scientific understanding, and I would change my views accordingly. 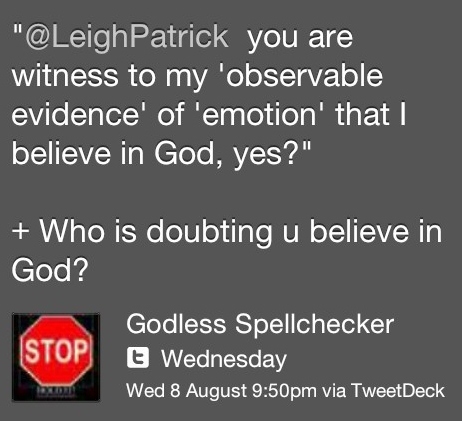 Are you trying to imply that Boolean Algebra is a method of “Proving God”? I find scbritton’s reply fallacious. And as for “this is not an insult, but…”? Highly insulting. Clearly, you have not read my replies in their entirety. Had you done so, you’d have seen that I begin with the premise that God is unprovable. If I’m taking the premise that God is unprovable, it would seem rather silly to then try to use “Boolean Algebra” to “prove God”. Since it (a) wasn’t “boolean algebra” (it was, in fact, calculus), and (b) wasn’t an attempt to “prove God”, your accusation falls completely, and entirely, flat. As for your second point; as a certain blogger said to me once: Offense is taken, not given. I used to be an atheist. I got better. If that bothers you, it isn’t my problem. Steven, you make the only argument for belief in God that can really be made, “God does not need to be proven.” Faith is a choice – you choose believe in God despite the lack of evidence or evidence to the contrary. However, this does not distinguish your belief from belief in any other god in the pantheon of thousands that humans have believed in since the time the human brain was advanced enough to do so. 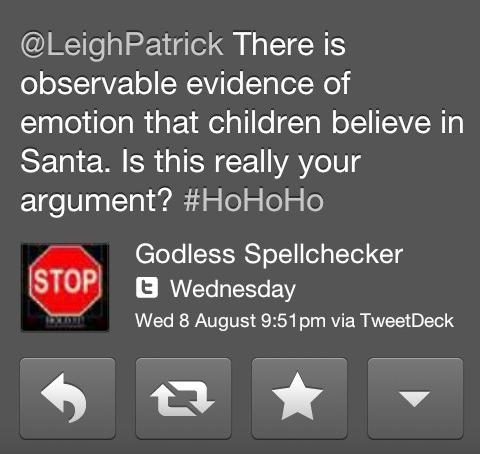 For that matter, the same argument can be made for a belief in Santa Clause or the chupacabra. First, why preferably later rather than sooner? I’ve always wondered this, even when I was a Christian myself – if Christians really do believe they will go to a paradise where they will be happy and without pain or sorrow for all eternity when they die, why do they fear death? The only explanation I can think of is that they don’t really believe it, that it is only a lie they tell themselves to make themselves feel better, but that beneath that, just below the level of consciousness, they know better. I can’t prove that hypothesis, but its the only one I have on the topic. Second, your complaint that without an afterlife life would be completely and utterly pointless, is one that many struggle with, and I think it is a main reason why so many cling to belief in the supernatural despite knowing, when all self-delusion is removed, that it’s all make-believe. However, if there is no meaning in the universe, and yet we humans experience a sense of meaning regularly, that means that meaning doesn’t come from outside of us – it comes from inside of us. If that is true, then meaning can be found in the universe and life regardless of whether or not God or an afterlife exists. This is demonstrated thoroughly by many non-believers who have lived life with meaning and purpose. Carl Sagan is the first to come to mind, but there are many other examples to prove the point that life meaning does not require a belief in the supernatural. 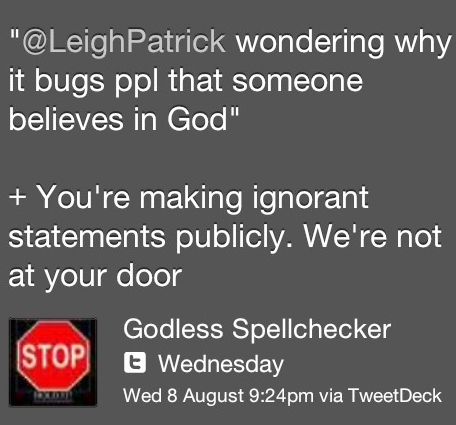 Furthermore, this argument only serves to justify your own belief in God. If you expect to convince others, then proof is required, and you have none. If all you wish to do is preserve your own belief, then it may be sufficient, but the fact that you took time to post here indicates a desire to convince others. You can’t expect other people to believe in something simply because you do, no matter how strongly your belief is held. To say then that belief in God needs no proof – that’s true of your own belief, but not if you expect me or the others here to believe, as well. I will grant you one point. 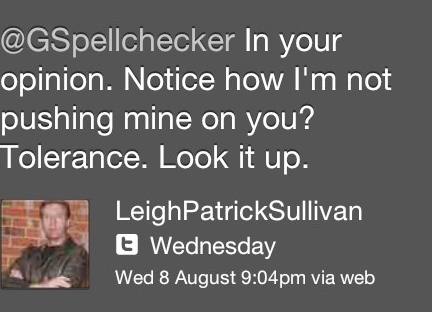 I think GSpellchecker does, occasionally, become unnecessarily condescending. It is not a big fault, as I am guilty of it myself. It’s very, very hard to remain civil with people who are generally uncivil and are trying to convince me to believe in an imaginary being with arguments I’ve heard hundreds of times before. 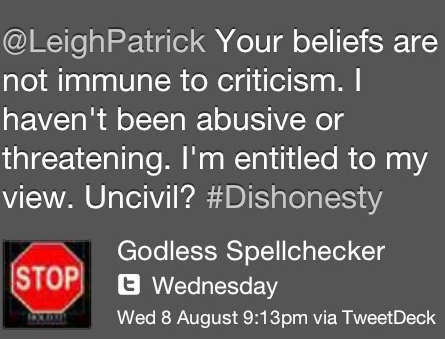 Once, I replied to a Tweet saying that all athiests (sic) should be deported with, “Try it, coward.” Again, not civil, and the “he hit me first” argument doesn’t even stand up in kindergarten, so I have no excuse. But, what can I say, we’re certainly not saints. No, if I were, as you suggest, a “troll” I would not have bothered to return here time and again to debate the subject on a private blog where my comments can be removed by the owner. But do continue to believe what you want. I have far more important things to do than be concerned about the insecurities of others. I enjoyed reading this discussion. If I may add a bit a curiosity, I am curious to here which concept of “God” is being presented here. No I am not going back to the reference of other mythological characters, but what is truly being debated with the term. I notice it is written as “God”; not “god”, “gods”, “extra-dimensional being”, or “Higher Power”. I see this as very important. My observation has been a fault on both sides of the argument going to the assumption of the Judeo-Christian God. The capital G seems to define this. A new term was brought to my attention a few months ago – ignostism. My personal view sees this as an important factor in the debate & I wish to see more people at least know what the term references. Far too often (when discussions reach the lull such as this one, where both sides fortify against progress) it is due to a simple miscommunication – in my opinion. One side relaxes their concept of faith to avoid concession to logic against the Biblical, and the other refuses to accept the concept of God, which has taken new form into something more of an external force to our current knowledge of scientific. I don’t see either side ever fully reversing their stance in agreement (viewed as defeat unfortunately), but I do think there is more room for progress to a better understanding of our purpose and direction we can all take, from 2 sides of a shared interest in knowing that one final answer that is currently viewed as beyond our measure. I’m not quite sure if my thoughts are conveyed properly here, or if anyone is listening, but I am curious to others thoughts on here. If further clarification is needed, due to faulty logic, broad assumptions, or poor grammar/communication skills; please feel free to ask questions or offer corrections. Is this in relation to the LeighPatrick issue or the scbritton debacle? It was a reply to the dialogue with Britton. 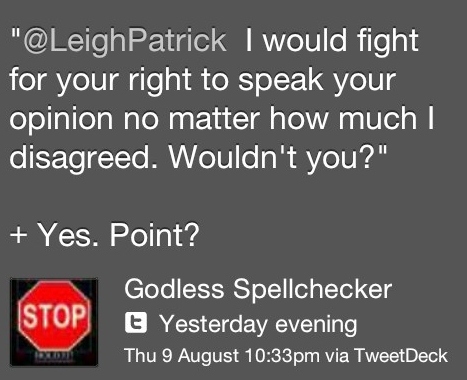 I don’t see it as applying with LeighPatrick because he didn’t have even the least bit of value in his comments. 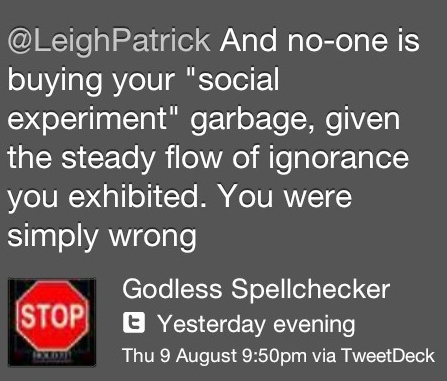 LeighPatrick comes across as childish and a “troll”, since the word has been mentioned. Britton seems educated, but I think is just inexperienced in the challenge to articulate this sort of debate. Which makes sense given the nature of the topic, it seems to always fall short around the same point of exhausted reasoning . No one has come up with adequate answers to continue moving forward, and people tend to rely on previous “points made” on both sides. 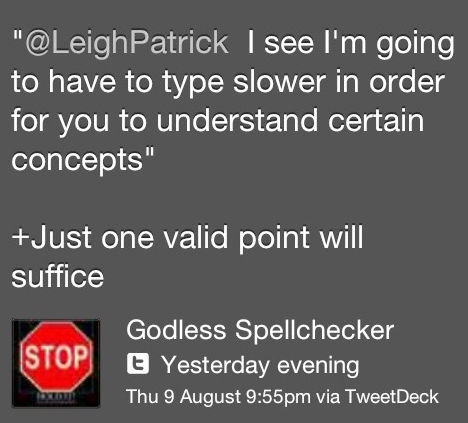 The point being missed by the anti-theists in this discussion is I have granted you every logic point you can make. If you want to examine the evidence, and nothing BUT the evidence, you will be lead to the atheistic conclusion you have come to. What I’ve tried to show you is that if you are open-minded enough to consider beyond the realm of what you has been explained, or even can be explained; if you’re willing to allow for the possibility that there is always going to be MORE than what can be explained, if you’re willing to just drop logic and accept the fantastic despite a lack of evidence, that’s what faith is. I don’t discount or dismiss science. I am a big bang evolutionist, after all. But it is not reasonable to expect a logical argument from something which isn’t logical – and as I’ve said, faith isn’t logical – It relies on accepting something without evidence. Again, Steven, how does this differentiate your God from any other god in the pantheon imagined throughout human existence? Furthermore, if we always attribute the unknown to the supernatural, and hold that belief through faith, then science is dead, and the advancement of human knowledge with it. Nothing else can be discovered, because it is all already explained. It is the reason why scientists have been vilified by the religious for centuries – they continually reduce the degree to which the known universe can be attributed to the supernatural. The aversion to this is the conclusion of “God”. Not an unknown force, not extension of sciences, it simply sums up the unattainable with a definitive. 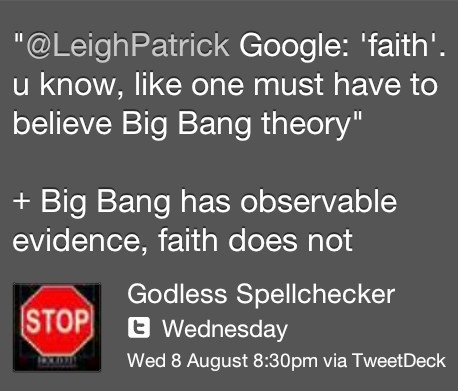 That is where I start to have problems with the concept of this definition of “faith”. Not only is it attributed to a deity, but a very specific deity others have named God. In one word this semi-reasonable conclusion to explain the unknown gets lumped in with many, many, many very unreasonable (and frequently dangerous) ideas. From my impression of your stance on this issue, I just don’t understand how you wouldn’t also be opposed to this? It seems to leave 2 options – 1) the ideas presented within the Judeo-Christian religions are not to be taken literal, therefore somehow allowing someone to pick and choose which to follow and disregard – yet somehow still remaining “Judaism” or “Christianity” and not just deism; or 2) people who present this sort of argument are being disingenuous in what they truly think and feel, and accept much more than they are letting on to given the teachings of the Book and Church. I would suspect the latter…. I say all this out of curiosity, part of the learning process I suppose. You have already stated that you accept the virgin birth, crucifixion, etc. ; that being said, why Jesus? I don’t see this question as being answered with your faith response. 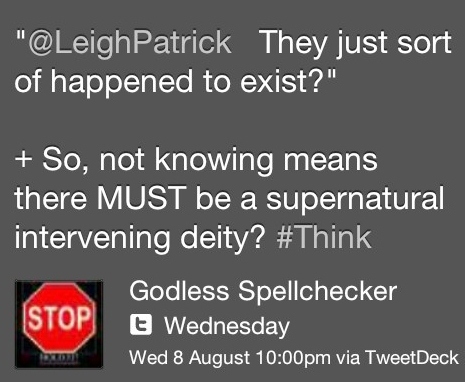 GSpellchecker tried to get at this earlier in the post, referencing the various other deities, I’ve actually seen this question presented quite frequently, and always with no response. It is a very specific decision to, even for faith based, to choose Jesus as the answer and I’m wondering if you have identified a specific point (either life experience, piece of scripture, teaching, formality etc) as being the deciding factor. You mentioned it gives you hope to believe in this, but what I am asking is why THIS one. There are many “salvations” out there. Assuming God exists, one has to also also consider that God will manifest himself in a way that is understandable and appropriate to the culture in question. Now, to your second question – why Christianity? Easy. It’s the one which I am most comfortable with as a result of my cultural upbringing. If I was raised in India, I would probably be Sikh or Hindu. Even so, being brought up unchurched meant that I was still scared out of my wits the first time I walked into a church – and I think that is a really sad thing. People say, “we’ll let our kids decide for themselves” which in and of itself, is fair and good; though unless you raise children to actually be comfortable within a church, very few will ever take the extra step to learn about the faith, and even then, walk in to a church to experience it, as it’s outside their comfort zone. I’d rather people be comfortable in church and choose not to go than be so uncomfortable with the idea of going to church that they can’t bring themselves to go. I would have to politely disagree. I view the actions of church hierarchy in the name of the establishment as being one of the most detrimental forces against faith. The church is not necessary for faith, better yet it isn’t even needed to have faith in Christianity. It seems nothing but an influential misconception that prohibits value to faith, resulting in a skeptical assertion of brainwashing. Then perhaps you attend, or have attended a church or churches which don’t work for you. I’m a strong opponent of “negative religion”, and I avoid “fire and brimstone” theology like the plague. I was reading the teachings of Buddha a while ago and stumbled, completely by accident, on a story which sounded very much like what Christians call the Parable of the Prodigal Son – where Jr is an idiot, demands his inheritance early, buggers off, squanders it on fast chariots and even faster women, and finally, penniless, friendless, hungry, crawls back home to beg his father for a job on the farm so he can start over again. Instead, his dad welcomes him home with open arms and throws a big celebration that his son has returned to him. I like to think of God being like that kid’s dad – not punitive, nor vengeful, but loving and caring beyond the point that any of us – myself included – deserve. So brainwashing? Not in my church. Indoctrination? Not in my church, just a bunch of unqualified, struggling hypocrites trying to follow a path together. Steven Britton says: “Assuming God exists, one has to also also consider that God will manifest himself in a way that is understandable and appropriate to the culture in question. So, is it your contention that there is no difference between all of the many gods of the world, now or throughout the history of mankind? That seems very unlikely given that the theology of the many religions are mutually exclusive. Your own religion’s scripture specifically states that no one may go to heaven without believing in Jesus Christ. This modern ecumenicism of yours may be comforting, but it doesn’t stand much scrutiny. The god worshiped by fundamentalist Islamists is not the Buddha. If more people thought this way I don’t think we would have anywhere near the hostilities we currently do, even if we never come to agreement. There is no progress, evolution of the mind if you will, through blind agreement or following. I commend you for taking the time not only in speaking with all of us here, but in trying to bring something relevant to the discussion, and having your own thought process to back it up, despite flaws. I hope you continue to do as you are, and I will do my part as well. For the record I have fundamental disagreements with the ideas (but am not fundamentalist?). Ha. I believe this is the direction we all must focus on. Not shutting up, not softening the blows, but making it very clear we should all be working towards a common ground of sorts, even if we never cross the line. Have the discussions (arguments in the philosophical sense), educate ourselves, and at least be open to listen to others expression of mindset, if never open to accepting them. Not sure why you waste so much time debating with the deluded. On the one side is rationality and reason; on the other is faith and a ‘feeling’. How can the two ever be reconciled?? If you could reason with religious people, there would be no religious people. If a Christian says “How arrogant to believe an omnipotent beings needs to present evidence” point them to 1 Kings 18. If their ‘Bible’ is to believed, 850 people were slaughtered when they failed to produce the demanded evidence for their ‘god’ (setting bull meat on fire with prayer). I generally like to point out that my secular morals would prevent me from slaughtering Christians when they also fail to set bull meat on fire with prayer. Good piece. Some may say you have the patience of a saint…I slay myself sometimes. Keep up the good work! I will answer the question posed to me now. In a debate the burded of proof lies with those making the claim. Would a voice in your head saying, “Hi, I’m God!” be enough? Would a giant Jiffy-Pop appearing in your living room and spontaneously start popping be enough? What would we become, if we through science, figuere it all out? Would would we become like a God? Are we humans so arrogant, that we feel that no other being/s could of already figured it out & are guiding us; as, we do our pets. I’m an Atheist, because I have no faith in a God as described in most religious texts. Why give us free will then punnish us? Why take credit for all the good, but then claim evil is do to our human nature, that was formed in Gods image? GS- what does your logic say are the answers to these questions? Mankind to greater understandings ! Reblogged this on suzzeq's Blog. Tolerance of intolerance is a diminution of our humanity, our ability to empathise with those whose opinions and ideas differ from our own. I too had an encounter with this person, it started with an answer to a scientific statement I made answering (the old oxygen can’t be seen but we know it is there Blah) i purposely kept away from even mentioning religion message after message to which the discution ended with “You tried to make me question my faith but never succeeded” it is this persons like many others goal to claim persecution, self preservation? not to look defeated? I don’t know the reason but minds like this chaps are all too common. Steven reduced his concept of “god” into a meaningless being that has no interaction with our universe. His pantheism would be rejected by the vast majority of theists on our planet as they would insist on their specific god belief as being The Truth and that their god or gods do interact with our reality. So Steven is a voice in the wilderness arguing for the existence of that which cannot be known, measured, or studied by the rational mind or by any scientific method. You just need “faith” that there must be something out there because without this belief Steven’s life has no meaning. The mental gymnastics performed to come to this conclusion is a fascinating insight to cognitive dissonance in action. It is a shame that more theists aren’t like Steven with his pantheism which does not promote the conversion of those who differ in worldview. I certainly respect Steven’s right to believe in this fascinating version of the god myth but he still does not get a pass on the rational, evidence-based criticism that he received in this forum. It still comes down to the old adage that extraordinary claims require extraordinary evidence. Faith is not the standard by which we understand the modern universe but it obviously filters the way theists perceive, accept and deny reality.